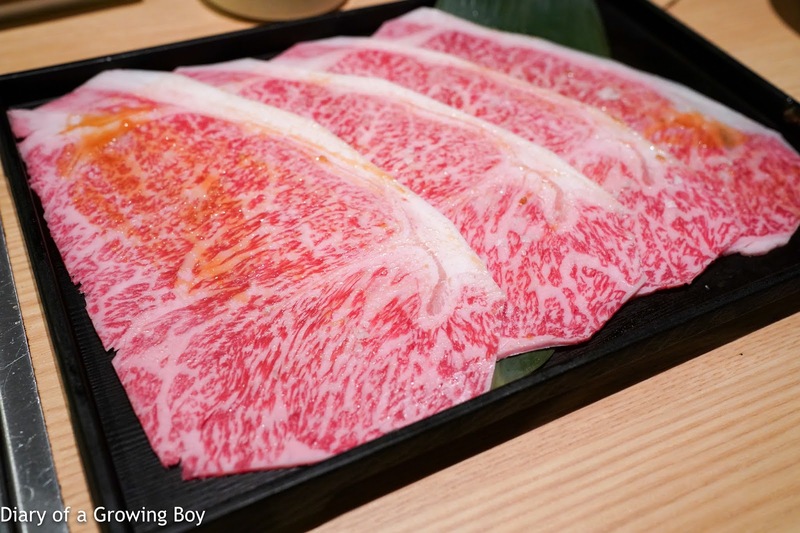 So... about 4 hours after I finished a long and delicious yakiniku (焼肉) lunch, I found myself back in front of another grill. I had made plans to come to Nikushou with Mr and Mrs Birdiegolf a few days before today's lunch got fixed, but I couldn't exactly cancel dinner. So... Hello Kitty and I would be eating our second yakiniku meal of the day. Thankfully I arranged everything through Spam Bro, and he was on hand to cook the beef for us. 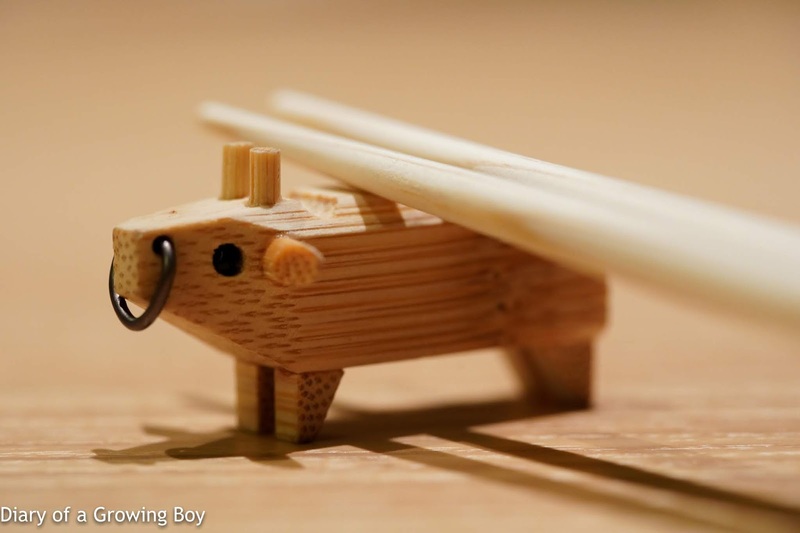 Of course, the first picture everyone takes when they come here - even before the food arrives - is of the cute cow-shaped chopstick rests. 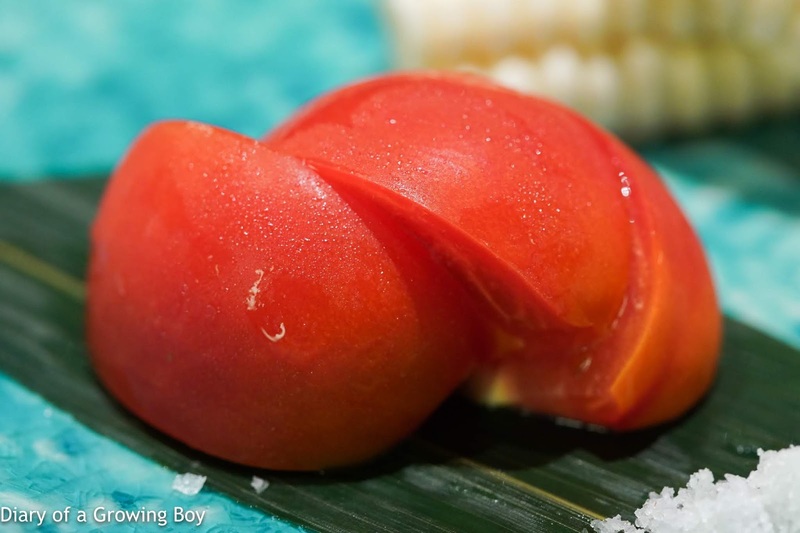 We started with some Amela tomatoes (アメーラトマト) from Shizuoka Prefecture (静岡県). 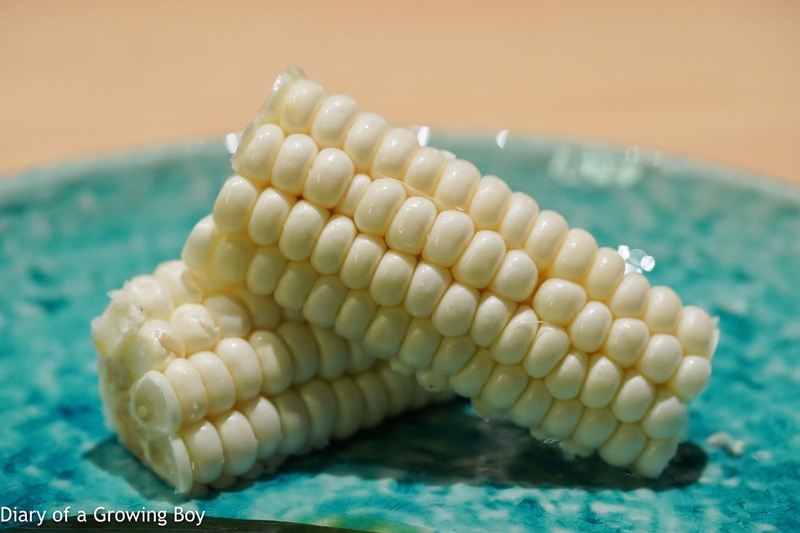 Also with some white corn (白いとうもろこし) from Hokkaido, which was very crunchy and starchy. 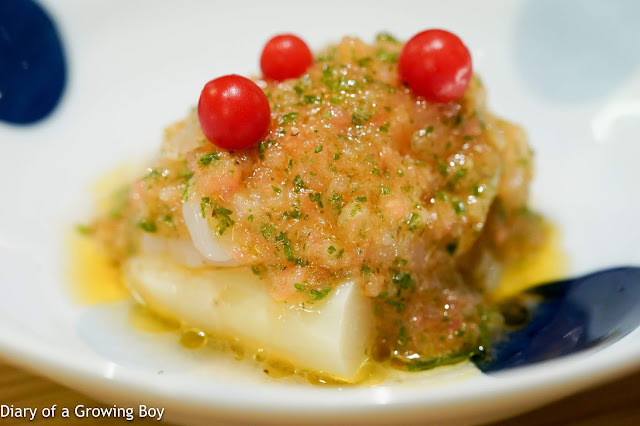 White asparagus with scallops and Japanese glass shrimps - above the bottom layer of French white asparagus were slices of Hokkaido scallops, topped with some Japanese glass shrimps (白海老) from Toyama Prefecture (富山県) and a sauce made with onions, perilla leaves and olive oil, along with Japanese micro tomatoes. Nice and refreshing, with good amount of acidity here. 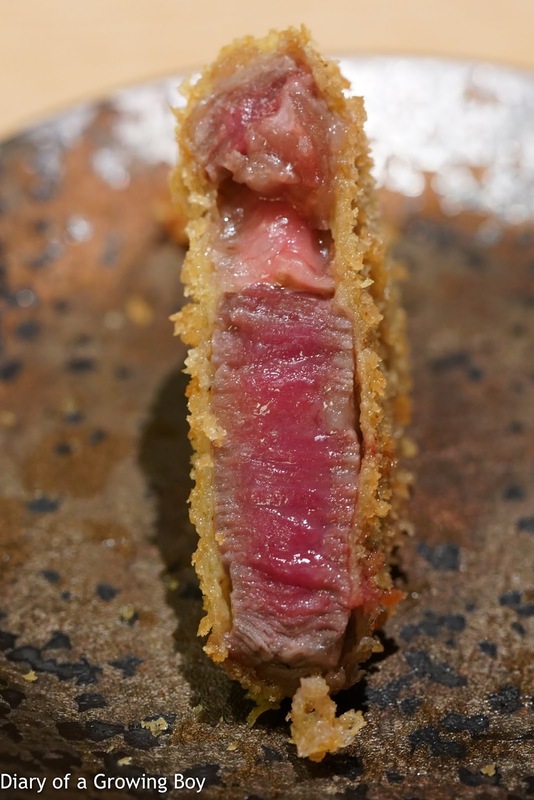 Beef katsu sando (牛カツサンド) - made with Hida (飛騨) beef. 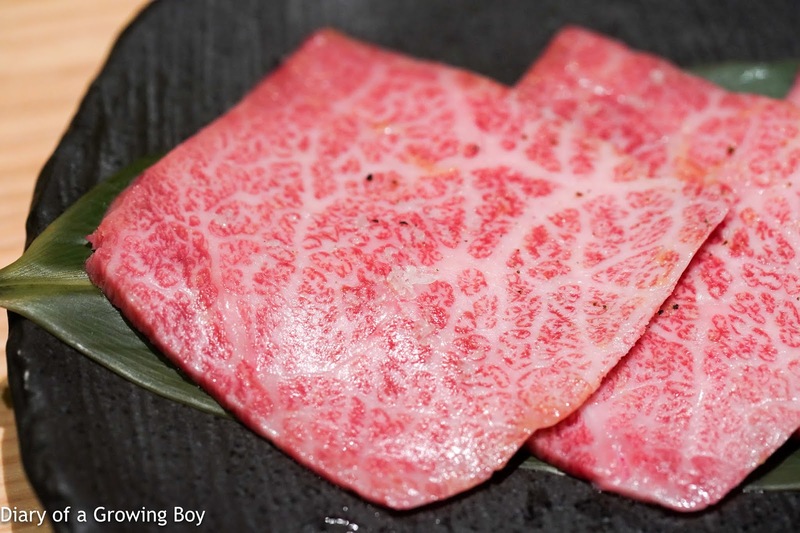 This was very nice and tender, thanks to the marbling and strips of fat. 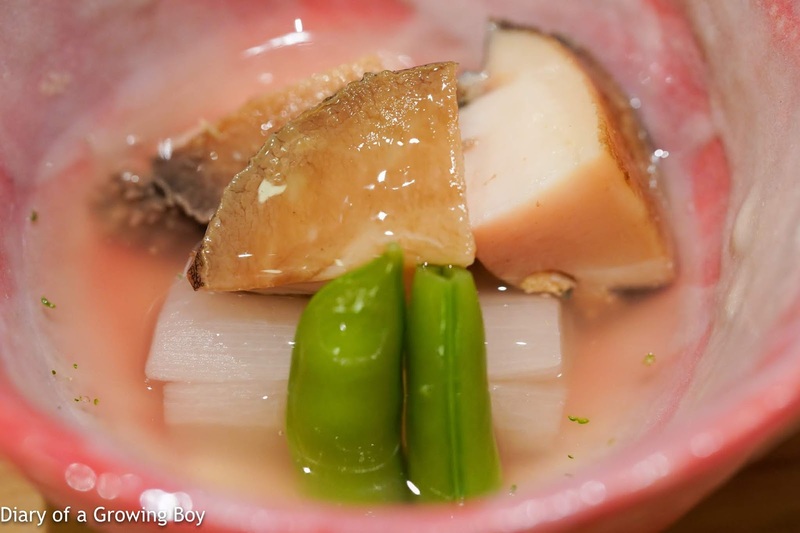 Simmered abalone with taro stem - the 4-head abalone from South Africa was simmered in dashi (出汁), and served with some sugar snaps as well as taro stem (芋茎). 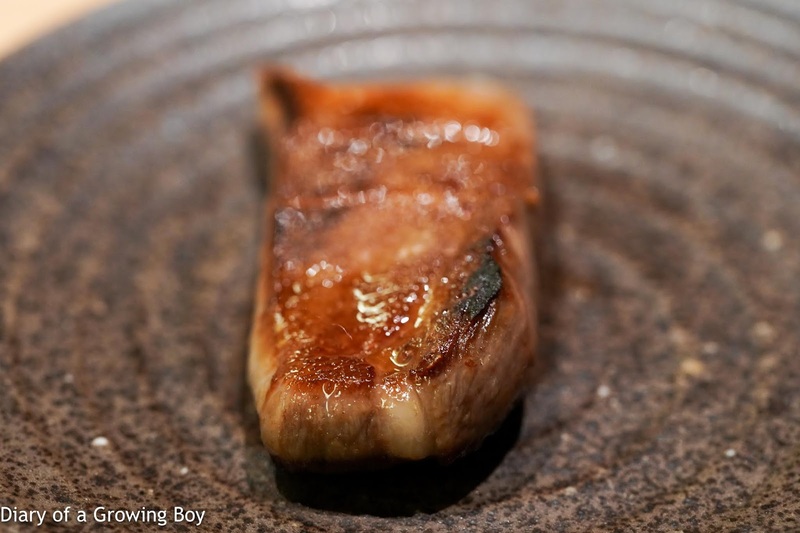 Needless to say the abalone was nice and tender, and a little fragrance from yuzu (柚子) made it better. 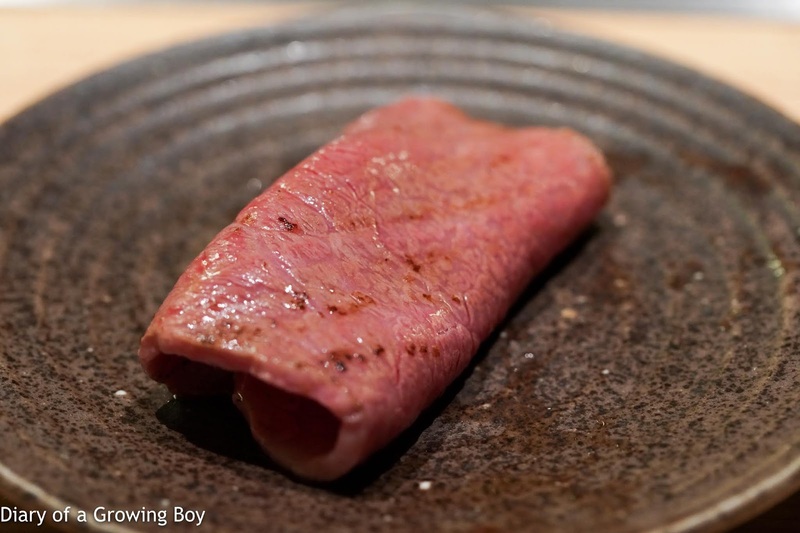 The tongue came thick cut and had a nice, springy texture. We were advised to dip the end closer to us - which was more tender - in the barbecue sauce. 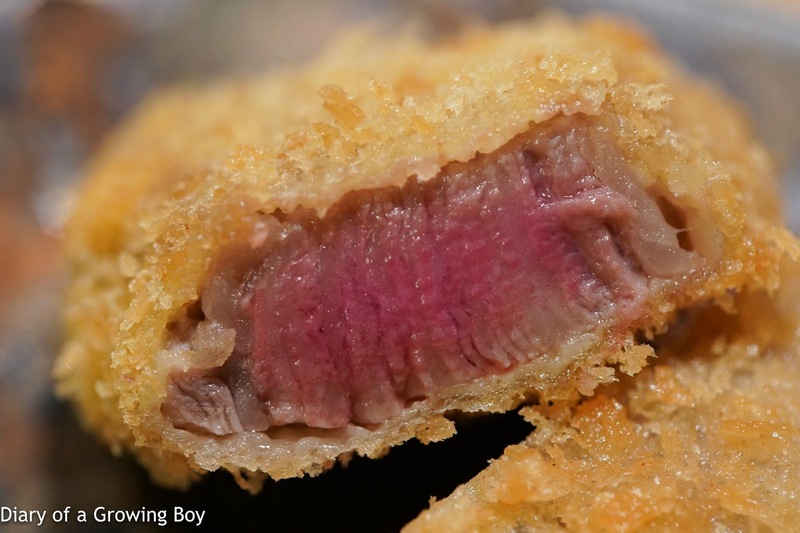 The other end was dipped in the lemon-based sauce. Delicious. 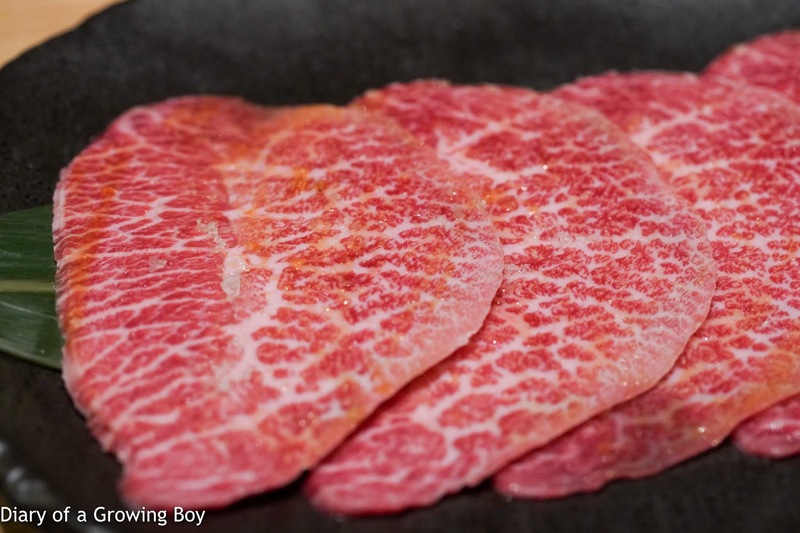 Chuck tender (トウガラシ) - from Matsuzaka cattle (松坂牛). This came in a thicker cut than I expected. 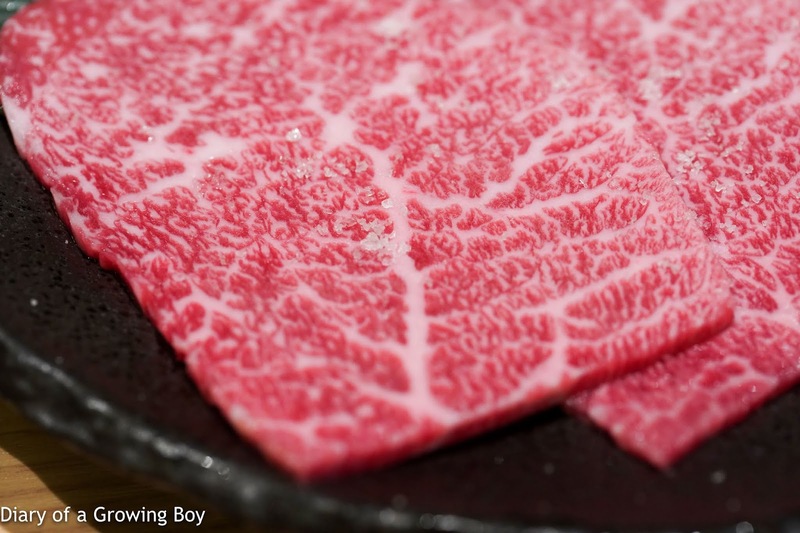 Top shoulder blade (ミスジ) - from 33-month-old Kobe cattle (神戸牛). 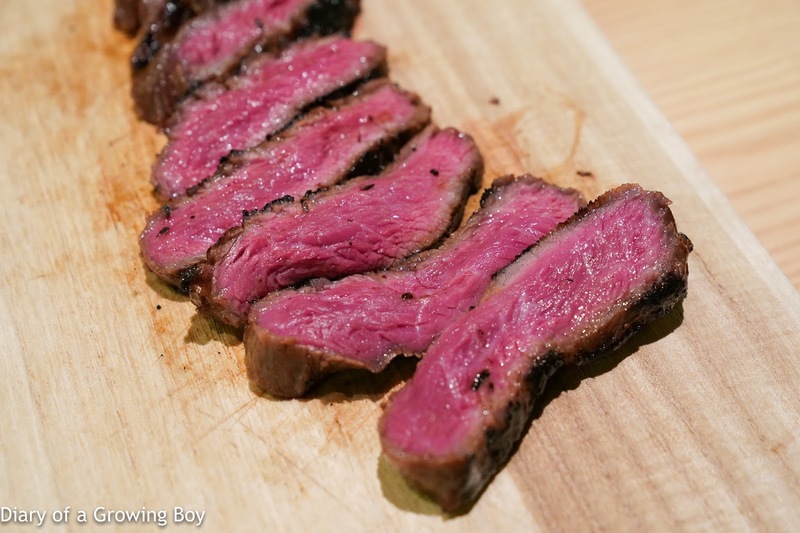 The charring on this was pretty nice. 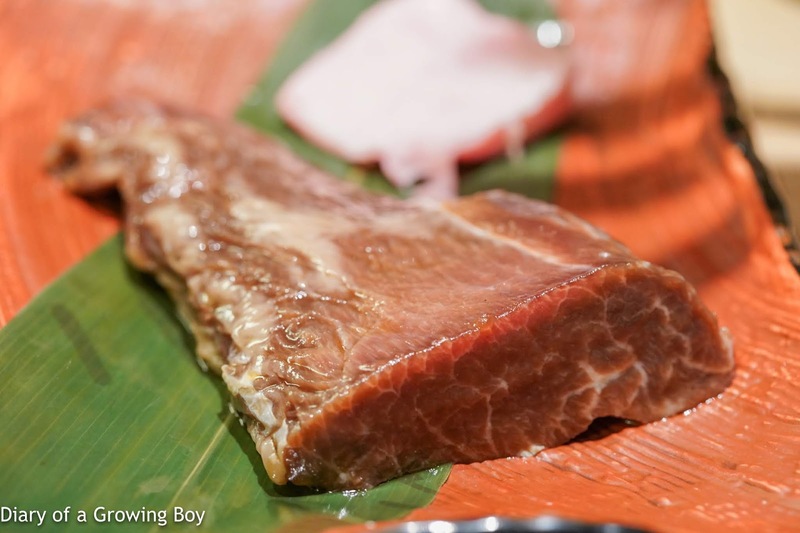 Rump necktie (ネクタイ) - this is apparently part of the rump that yields about 300g per cattle. 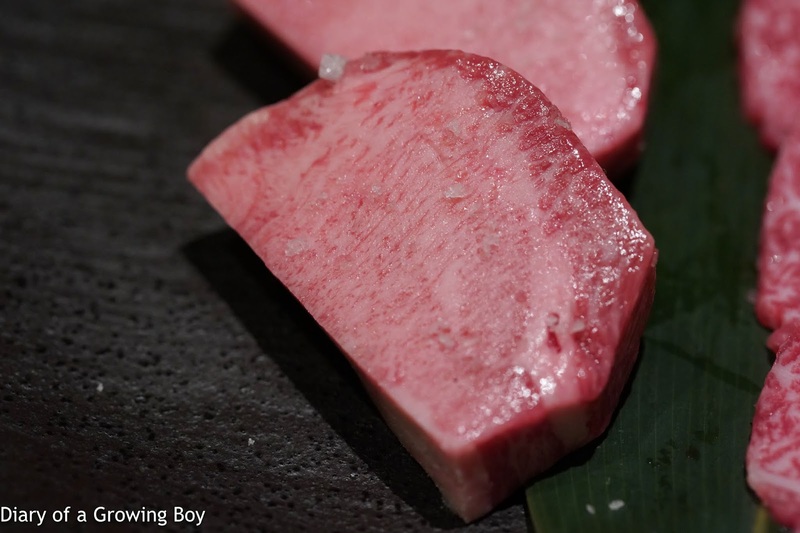 This cut from Kobe cattle was marinated for 3 hours. 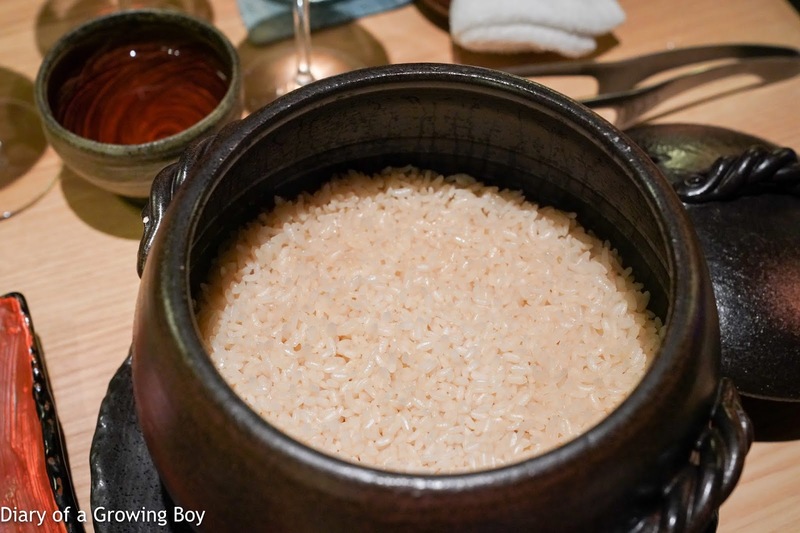 The rice was cooked in the pot with soy sauce dashi (醤油出汁). 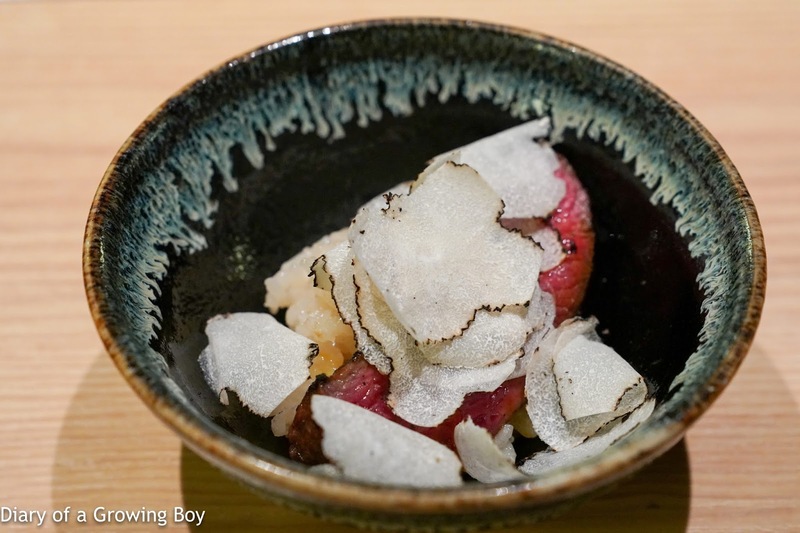 Served on rice, and with summer truffle shavings on top. 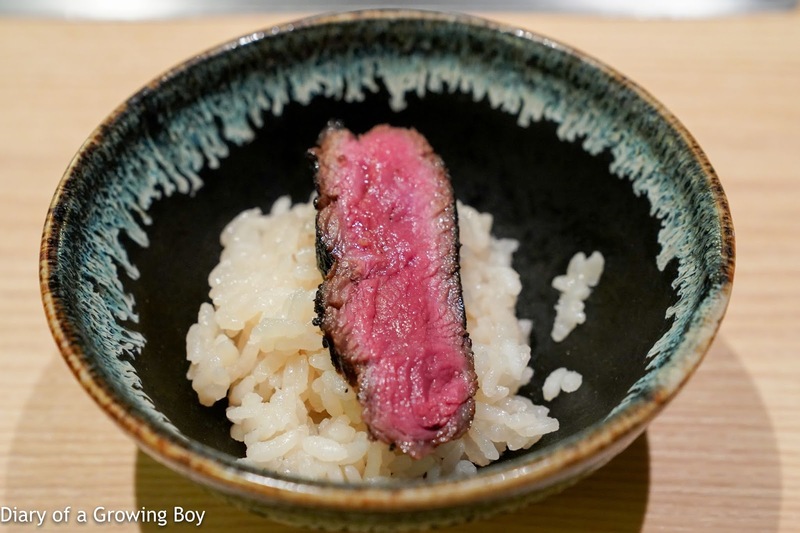 While one would think the rice comes at the end of the meal, that wasn't the case here. 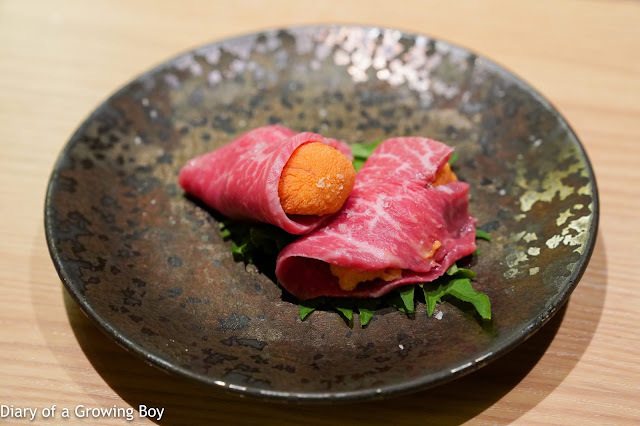 We also got what Spam Bro called "ice cream"... which was a slice of filet from Hida cattle - served raw and cold - wrapped around some raw sea urchin. Yes, it did melt in the mouth... almost. 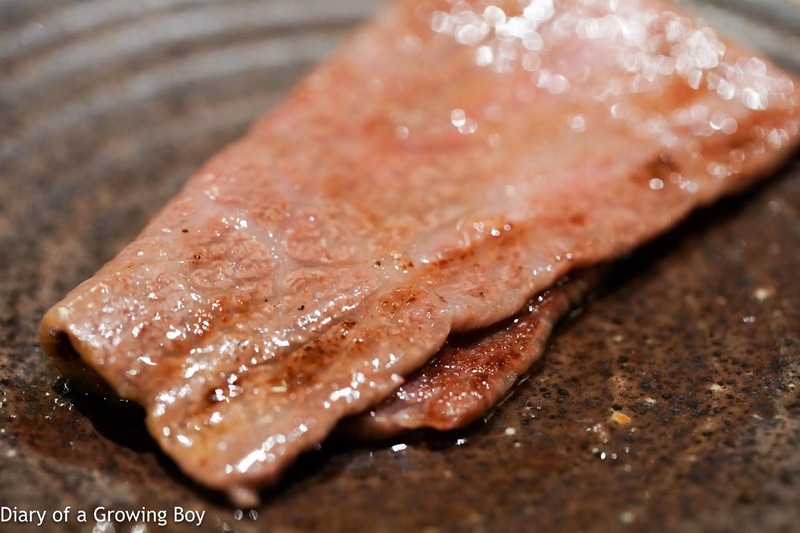 Chuck flap (ザブトン) - also from Hida cattle. 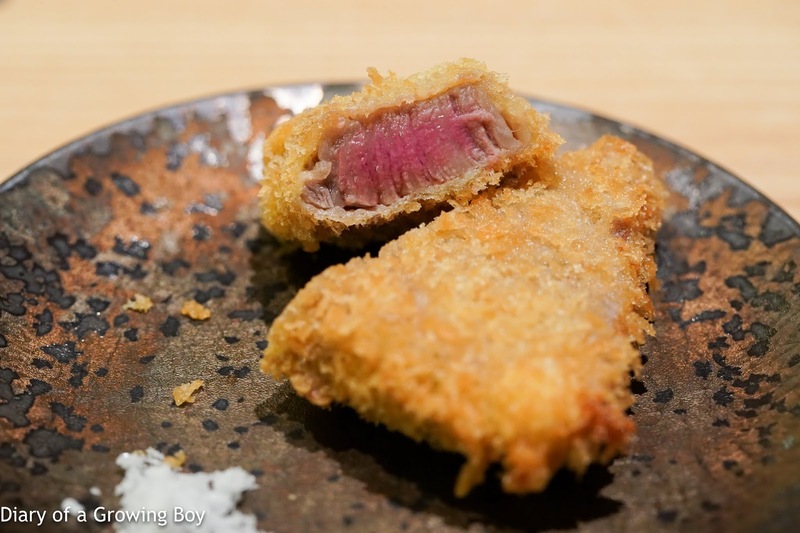 Very tender as expected, but rather on the salty side with the seasoning. 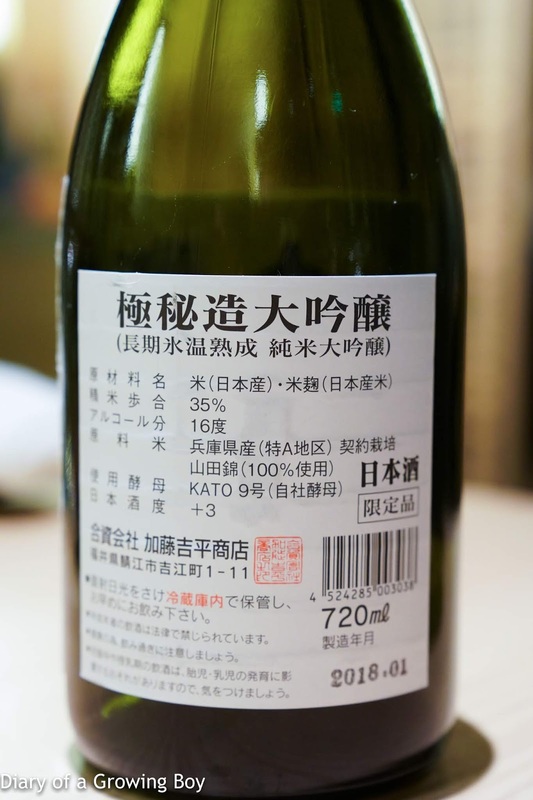 Born Gokuhizo Daiginjo (梵 極秘造大吟醸), BY29 - fragrant nose with banana notes. Lovely. 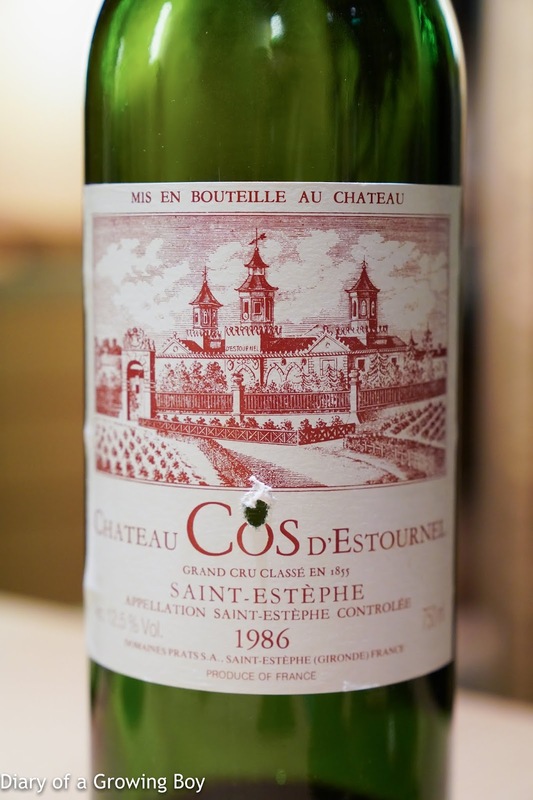 1986 Cos d'Estournel - served an hour after double-decanting. Nose very muted, with a hint of grass, a little earthy, and minty. Finally opened up a little 2 hours after first serving. 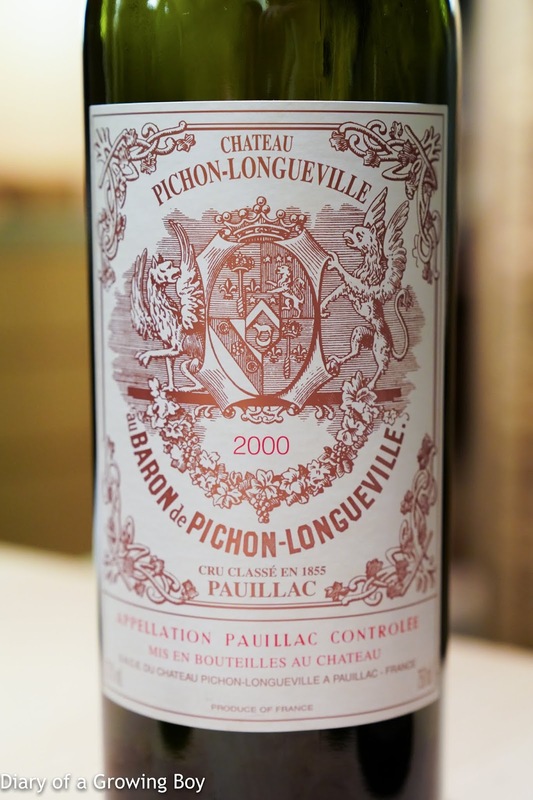 2000 Pichon Baron - served an hour after opening. 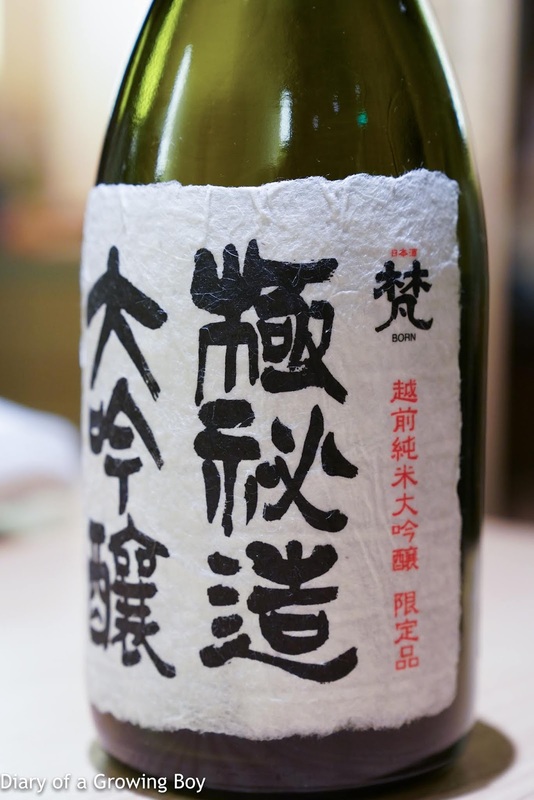 Smoky, ripe fruit, fragrant with cedar notes. Tannins are still here and a little grippy on the palate. Many thanks to Spam Bro for taking good care of us. Bummed that my enjoyment was somewhat dented by the fact that I was never hungry to start with. 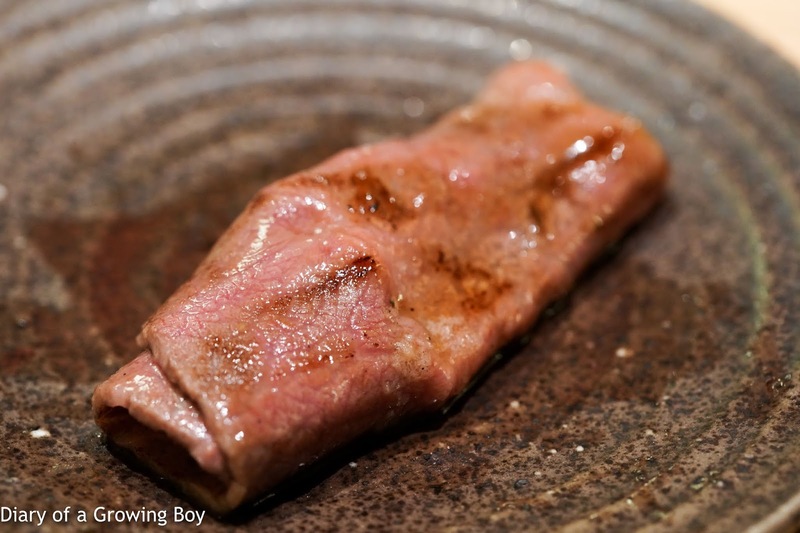 Next time I will try the beef curry... Meanwhile... time to diet!